We are often asked what is the best guitar and however much we want to give a single answer, it unfortunately isn’t that simple. There is no such thing as the best guitar, rather the key is finding the best guitar for you. 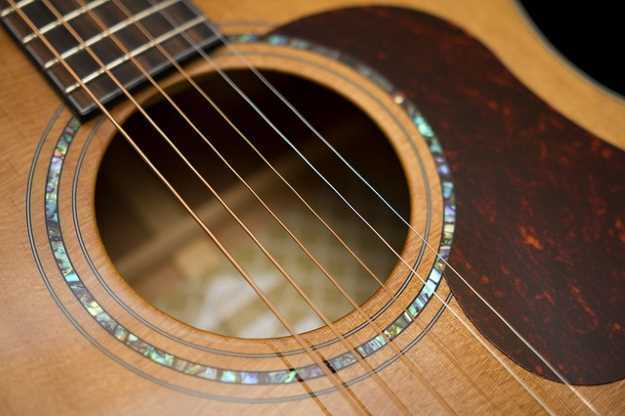 In this guide, we present 11 factors to consider when hunting down the best acoustic guitar. We cover the main measures of suitability and offer some insight into how to make the choosing process easier for yourself. The shape and style of a guitar is a recommended place to begin hunting down the best acoustic and they have a crucial influence on how it may sound. There are numerous styles with some of the most popular being the dreadnought and the 000, or OM. The pear-shaped Dreadnought has the best balance of treble and bass, and good resonance, hence its popularity. The sound is boomy and works well with styles of music where strumming is predominant. A band setting benefits most from the dreadnought shape due to the carry of the shape and its ability to cut through the sound of other instruments. You can buy dreadnought guitars with or without a cutaway. With a cutaway, the notes below the twelfth fret are more accessible. Consider this if you hope to play high notes further down the neck. 000/auditorium and OM (Orchestra Model) are hourglass shaped and are more mellow, ideal for fingerpicking. They favour mid range frequencies and the smaller size means they are generally more comfortable to play. Both the OM and OOO take the same body shape, but OM have a longer scale, wider neck and more space between the strings. OM is recommended for intimate playing situations and recording sessions due to the balanced sound it produces. Continuing on from the 000/OM family, there are larger models like the Jumbo and 0000, as well as ever so slightly smaller equivalents such as the 00 and 0. The smallest bodies available are traveler and mini. Traveler guitar bodies take on rather unusual shapes to save space and weight. These are ideally suited for travel and public transport. Mini guitars are slightly larger and take on the classic 000 shape, but in a much smaller iteration. Keep in mind that these small bodies don’t have the same projection as larger models, nor do they offer much in terms of low frequencies. Next is the parlour shape, which is larger than a mini and smaller than a classic 000 shape. They favor fingerpicking and are geared towards more mellow styles of music. They are easy to play and are extremely portable. If we are to give one piece of advice, we suggest going for something versatile like a dreadnought. The projection, balanced sound, and adaptability make the dreadnought shape the body of choice. Though better suited to strumming, it performs well with other playing styles. As final note, there are more adventurous shapes out there, which may suit you better, such as the round back shape made by Ovation guitars. Made with plastic, the back of the body resonates well and creates a unique sound palette. It is also perfect for more hardy musicians and responds well to adverse weather conditions because of the durability of the plastic construction. Use longevity as a measure of the appropriate size. The long-term use and your plan’s as a player should dictate what size guitar you opt for. Consider style of music, in what context a guitar will be played and the physical attributes of the player. If you are serious about playing, a full-size body is the only way to go. If you plan to travel, consider the smaller sizes. When buying for a child, we recommend a ½ or ¾ size guitar as a good starting instrument. ½ size guitars are small enough for diminutive builds and hands, and act as a gentle initiation into learning guitar. They are also a great stepping stone towards a full-size model. They also remain fairly inexpensive and are generally made to robust specifications meaning they can handle bumps and bruises. ½ size is recommended for children below the age of 6-years and ¾ for those aged 9-years and below. These sizes are also ideal if you plan to travel with your guitar. Size doesn’t just apply to the guitar as a whole and the body, but also to smaller components. Below is a short summary of the ones that have the most impact on size considerations. Neck shape is the profile of the back of the neck and determines how a guitar feels in the left hand. It has implications on playability by determining the accessibility of the frets, notably for more complex chords that require stretched finger positions. The nut width determines the spacing between the strings and how comfortably a fretboard feels when playing. Scale length is the distance between the nut and the bridge. A longer scale puts more tension on the strings to create a louder volume. It also determines the spacing between the frets. A shorter scale makes the frets closer together, increasing comfort levels for players with smaller hands or shorter fingers. Sound is generated from the top of the body, the back and sides are rigid in order to direct the sound back out. The top, also known as the sound board, has a crucial role in determining how the vibrations of the strings are transferred to the body for amplification, shaping tone as well. The top wood vibrates and pushes the sound throughout the body and out again to generate the tone and volume we recognize as the archetypal guitar sound. Here we discuss the two options available; solid top and laminated top. A solid top is, as the name implies, a single solid sheet of wood (sometimes two pieces from the same piece of wood cut to make construction easier). It tends to provide a more nuanced and colorful tone. It also ages well, allowing the wood to open up and resonate. Solid tops also have more interesting cosmetics because the natural characteristics of the wood can shine through to create patterns and color shifts. Solid tops do come with a higher price tag though. Spruce, and the many variations of spruce (koa, sikta, adirondack, etc.) are the most popular tonewoods for solid tops. They produce a clear and bright sound that reverberates loudly for good projection and are also very light in terms of weight. Mahogany tops that are usually paired with mahogany back and sides have a warm, full sound with a rich mid-range that is favoured by blues and country artists. The sound is balanced providing a depth that is suited to recording sessions and smaller performances. Cedar tops have a deep, mellow tone with a great deal of character and color at low volumes. They are generally found on nylon string guitars. Laminate wood is glued layers of wood bound together. More often than not, the leftover shards and layers of wood from the solid top production process are gathered together, then compressed at very high pressure to create laminate. Sometimes synthetic materials are used, partly because they are inexpensive to produce and mainly for their durability. The sound doesn’t evolve over time with laminate tops and stays identical to the way it was when the guitar was made. The tone of laminate top guitars tends to be constant without any nuances, somewhat synthetic and predictable. The reduced vibrational qualities of laminate mean the sound suffers in terms of richness and volume. Solid tops produce a fuller sound with more subtleties and definition. Quality does, however, depend on the expertise of the guitar maker. An experienced luthier can make even dull wood sound great, while a shoddy luthier will make even the rarest, most reverberative wood sound lackluster. For example, if we take the same manufacturer and pick out a solid top guitar as well as a laminated version, the solid always sounds better and louder. Budget also plays a part in choosing between a solid and laminate top. Laminated models are much more affordable and for a beginner, there is no sense in spending more than is required simply to have a solid top. You won’t yet benefit from the sonic improvements that a solid top provides and it will essentially be a waste of money with no tangible benefits to you. We recommend that you worry more about who and how a guitar is made, rather than get bogged down in the intricacies of what it was made with. Wood is a natural product that isn’t manufactured to precise measurements in a sterile factory. While growing it is at the mercy of the elements, the quality of the nutrients in the soil and the weather. The result is that wood, even from the same species, can have different characteristics and sound. If we take two or three guitars from the same manufacturer, same model, all with solid tops built in the same way, with the same type of wood, they will all sound different. This difference is a double-edged sword that is responsible for the inherent beauty of the instrument and plays a part in given a guitar personality and fostering emotional attachment. Equally, it means finding the perfect guitar can be an arduous process, but don’t give up, the reward is worth the work. Playing a particular guitar before buying is, therefore, the best way to gauge whether it is right for you. Best is a deeply subjective term and only you can truly decide what constitutes the best acoustic guitar. Solid top or laminated top, there is no all-encompassing, ubiquitous answer, it is entirely up to you and largely dependent on your budget. Laminate is a great option for a beginner guitar. The importance of wood in the build of an acoustic guitar needs no introduction, but we must stress how important the type of tonewood is to the quality of a guitar’s tone. Tonewoods are used for the body, top, neck and fretboard. Each part has implications on overall tone. Here is a list of the most widely used tonewoods and their properties. If you know exactly what kind of sound you want, this should help you narrow your options down to a few models made from tonewoods that have the required qualities. Koa – emphasizes mid range frequencies. Maple – focuses on trebles, low resonance. Rosewood – full, defined frequencies even in the low-end, nuanced overtones, and loudness. Ebony – primarily used for fretboards, very smooth for fast playing. Cedar – bright and responsive. Walnut – defined mid range frequencies, loudness, shimmering highs and depth to the low end. Sapele – resonant, emphasized mid-range and treble. Ovangkol – warm, rounded and chiming mid-range. Mahogany – beyond solid top use, it is found in necks for a controlled, mid-heavy tone. Budget is always a consideration. You don’t have to pay a fortune, but budget largely determines the quality of the guitar you can get. This is both a boon and a burden, in the sense that you must censor yourself from considering more expensive guitars, yet know that you must select from a reduced band of options in your given price range. Should you be lucky enough to have an unlimited budget, this puts you in a perfect situation. You now only need to base your choice on sound as the construction, wood and components have not been compromised to reduce the cost. Brand names are a contentious issue. You can rely on them due to their reputations, but with this comes a price tag or a budget line of models, where corners have been cut simply to have a guitar stamped with a famous logo. Or worse, a batch of branded guitars that simply sound mediocre due to lower wood quality and other unforeseen factors during the manufacturing process. We recommend that you don’t pay too much heed to brand names if you have a limited budget. Price point and sound are far more useful measures of quality. Likewise, looks are also something to be wary of. A flashy guitar with all the trimmings doesn’t necessarily sound better than a dull looking counterpart. Though difficult, take a step back, ignore the look and concentrate on the feel and sound. A guitar’s value can increase with time. A mass-produced, budget model clearly won’t, but if you invest in a high end model, the chances are it will be worth a lot more in as little as 20-years. For example, pre-war Martins are estimated for sale with a price tag in the hundreds of thousands of dollars. With this in mind, paying more for a high end model doesn’t simply provide a spectacular sound and unmatched playability, it is in many ways also an investment. If you get a quality instrument, you get a guitar that can, and probably, will appreciate well. Action determines how much pressure needs to be applied for the strings to fret. It stands to reason that the smaller the gap between the strings and the neck, the easier it is to play a guitar and get a quality sound. The issue with acoustics is that as we get closer to the neck, the strings come into contact with the frets and tend to buzz. Finding that action sweet spot is a sing of a good guitar. Intonation occurs where the strings come across the saddle. This point of contact is critical to the sound of the guitar in question. Placement of the bridge and saddle has an impact, as well as the angle of the saddle. With a good guitar, they are set up to function properly. The best way to determine the quality of the intonation is to ensure that notes ring true at every point on the fretboard. Any discrepancies manifest themselves as shift in the tuning and can make it difficult to play in tune. We also have the truss rod, adjustable to counteract the pressure of the strings. Fine tuning the truss rod is important to ensure the longevity of a guitar. Steel string guitars are always equipped with a truss rod due to the added pressure demands of the strings. Nylon string guitars are subject to less pressure and don’t have a truss rod. Truss rods are a good backup feature to have, which makes steel string guitars good value. Any movement in the angle of the neck can easily be adjusted. While with a nylon guitar, fixing any issues entails expensive repairs called neck resets, otherwise, the guitar is simply unplayable and obsolete. All these factors determine how playable a guitar is and are a good starting point when test driving a particular model. Acoustics use natural amplification to project their sound. The strings play a crucial part in determining the quality of the sound emitted, much more so than on even the best electric guitar. The design, materials and gauge are of utmost importance, as well as the type of guitar being strung. Bodies like the dreadnought and jumbo are designed to handle the extra tension synonymous with steel strings. If nylon strings are equipped, they can cause irremediable damage to the construction of the guitar. Vice-versa, a nylon-designed body like a parlour cannot support the tension of steel strings. Your choice of strings, therefore, depends first on the type of body you have. In terms of gauge, note that larger guitars deal better with larger gauges, while smaller bodies shine best with the lower gauges. Different styles require different strings. Fingerpicking favors nylon strings or low gauge steel strings, while strum-heavy genres benefit most from high gauge steel strings. A good compromise is to find a middle ground gauge that works for both styles. Steel strings pack more of a punch and if they are high gauge, the tone produced has an added depth in the low end. Conversely, low gauge nylon strings provide better high end that favors brightness and technical styles of play. Nylon strings are made primarily of nylon, fluorocarbon, metals and a whole host of synthetic materials. In general, the top three low strings are made with multiple strands of nylon covered with a winding layer of light steel, while the high notes are nylon or a synthetic alternative. Nylon is a flexible material and because of this the strings go out of tune rather willingly, notably in changing environmental circumstances. Classical, folk and flamenco genres use nylon strings. The steel name is somewhat confusing when it comes to acoustics because the strings aren’t actually always made of steel. Materials like bronze, brass, and phosphor bronze are far more popular. Steel strings stay in tune far better than nylon versions. Genres that favor steel strings are folk, country and rock. The most widely used are 80/20 bronze strings, which are 80% copper and 20% zinc. They have a bright, clear and sustained sound. The only downside is that they tend to lose some of their brilliance due to bronze’s inclination towards quick oxidation. Phosphor bronze strings are essentially 80/20s with added phosphor to slow the onset of oxidation. You do lose some clarity as a consequence, but they last longer. The tone provides more warmth while retaining a decent amount of brightness. Aluminum bronze strings have a better life expectancy than bronze, and offer better low end response and sharper highs. You can also expect better clarity than what is lost with phosphor bronze strings. Silk and steel strings are a happy medium between nylon and steel strings. Silk is coated in steel (and sometimes copper) to create a more mellow tone with soft contours and a shimmering quality to the sound. They favour fingerpicking. There are still more, less popular, options such as polymer coated strings, which lack the brightness of non-coated equivalents, but offer better oxidation resistance and a longer life. Or, brass strings for a metal-like tone. Popular consensus suggests that nylon string guitars are a better choice for beginners because they are easier on untrained and smaller hands. Though in terms of tactility this may be true, the neck on nylon string guitars tends to be wider than on those with steel strings. Beginners can struggle to wrap their hand around the neck to play chords and navigate the fretboard. If you line up one guitar of each kind side by side, you can immediately note the difference. Obviously, certain models have a more pronounced difference, but in general nylon string guitar necks are significantly larger and only increase in size as you move down the neck. You must therefore make a decision between harder strings and a thinner neck or softer strings and a wider neck. There is no right answer and it really depends on personal preference. One thing to keep in mind is that a normal part of learning to play the guitar is developing calluses on your fingers. You will invariably go through a period of tenderness, varying in severity person to person. Calluses are crucial to protecting softer tissue from the rigours of applying pressure on the neck and they help develop endurance over time as well. Steel strings allow the calluses to set in faster and once they appear you are pretty much set to play any kind of guitar from there onward. If you plan to play classical style guitar, we do recommend getting nylon strings because they are an integral part of the genre and help define the orchestral sound. Most guitars are available as an electro-acoustic version and it is worth considering whether you want amplification when buying. Remember that it is expensive to install an electro acoustic component in a pre-existing guitar rather than implementing it during manufacturing. Furthermore, ad hoc amplification never sounds as good as when it is built-in. Many first time buyers don’t see the utility in getting an electro-acoustic guitar, planning to only play at home or within an intimate context. A couple of years down the line, when they decide to play gigs, take their guitar to church or join a band, they almost always regret their decision. If you are unsure whether you should go for an acoustic or electro-acoustic, the advisable choice is to be safe rather than sorry and go for an electro-acoustic. Tracking down the best guitar for you can also be an enjoyable process. As you scour the market, learn about different tonewoods available and understand how the sum of the components makes a guitar work, you are getting a valuable learning experience. This knowledge can then remain with you as you learn to play, consider buying your next guitar and generally further yourself as a musician. Remember to savor it all and remind yourself that the end goal is a guitar that not only feels great in your hands, but plays equally well.